There was a time when we would do the AYCE lunch at Thai House (which has recently been revived) with a big group of friends. And why not? It was inexpensive while offering up lots of choices. 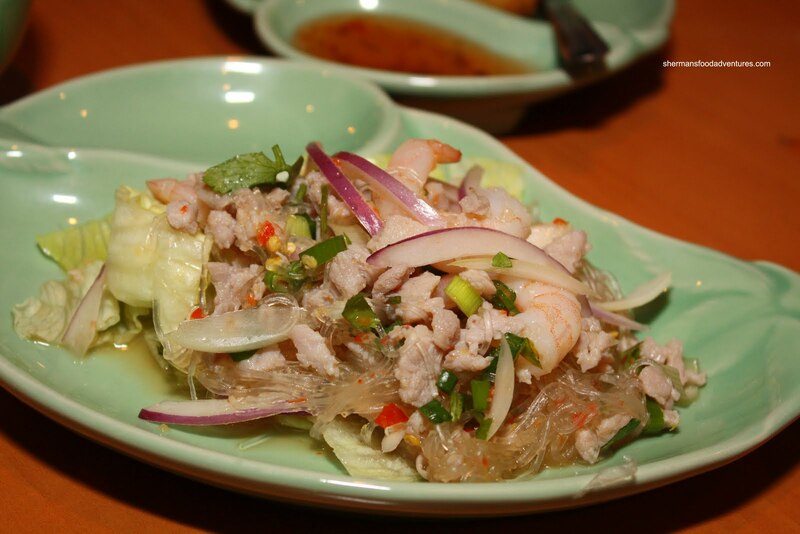 Sure, there are those who will immediately point out that Thai House isn't exactly the pinnacle of Thai cuisine. But honestly. We're in Vancouver, not Thailand. As mentioned over and over again, restaurants are in the business of making money, paying their bills and employing a bunch of people. Consequently, they are not really all that interested in satisfying a minority of people who want over-the-top Thai food. Restaurants conduct the ir day-to-day operations to satisfy their largest customer base. If it is "safe" Thai food they want, that is what we'll all get. For all those whiners who want to slam any ethnic restaurant for their lack of authenticity or proclaim the "food is better in Thailand", they can buy themselves a plane ticket and go there. We live in Vancouver, the restaurants operate in Vancouver and voila. End of discussion. 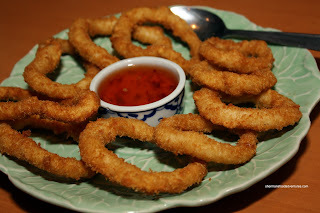 Okay, I'll get off my soapbox now... For me, I consider Thai House the McD's of Thai food. That in itself is not necessarily an insult. 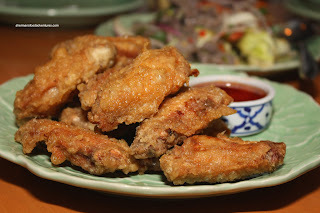 Thai House does what it does wel l - makes Thai food accessible to all for a reasonable price. As we all know, going out for Thai food can sometimes be a pricey proposition due to the modest portion sizes. 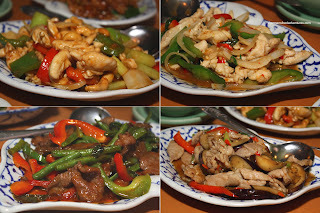 Unless we want to visit hole-in-the-walls such as Lhy Thai, one can easily spend $20.00+ for dinner. So imagine my curiosity when I found out that Chilli House Thai Bistro began offering an AYCE dinner for only $16.00. 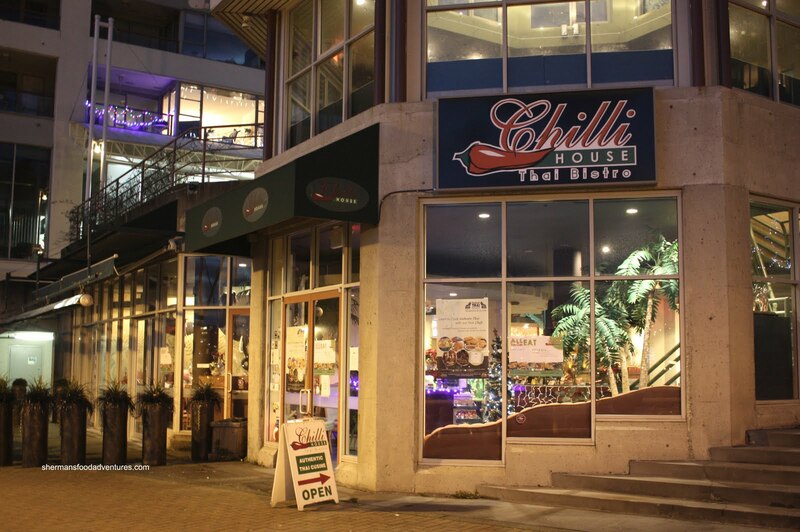 If you don't already know, Chilli House is affiliated with Thai House as with Urban Thai, Charm and Samba. So yes, there are similarities between all of them except Samba. Other than the fact I wanted to try their AYCE, it was a perfect opportunity to meet up with some friends over the holidays. Joining us tonight were Bluebeard, Nikita, Herbie the Lovebug and LanaBanana. Good thing too, that means we could order lots and try almost everything on the menu! Little did I know, there is actually free underground parking. We parked a couple of blocks away. For me that is a real bonus since the parking is expensive in Downtown. Anyways, we finally got down to ordering starting with so me appies. The first to arrive was the Tia Muk Tod or fried squid. Nothing wrong with this dish. The squid was tender with some chewiness and the breading was crispy and none-too-oily. The same can be said about the Fried Chicken Wings. Fried until crispy and juicy inside, these were gobbled up quickly. I particularly liked that they had flavour of its own, so it wasn't solely up to the sauce. As for the sauce, it was sweet and tangy. 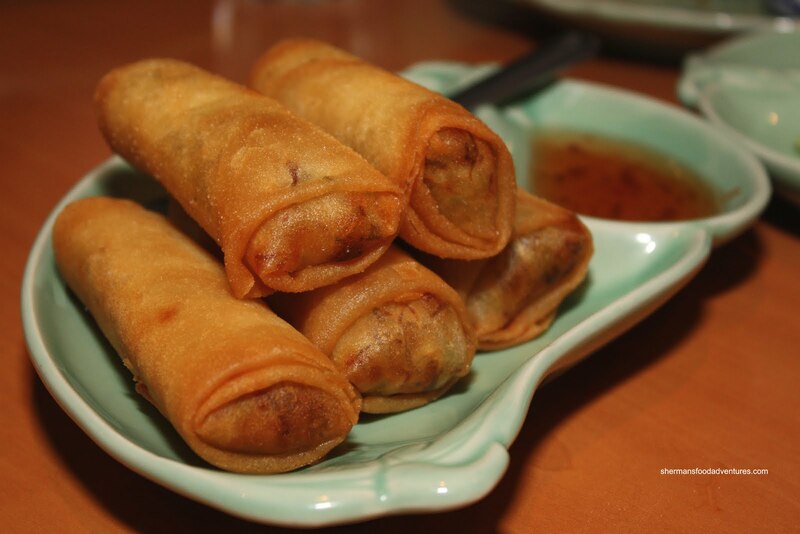 Not too sound repetitive; but the Por Pia Tad or spring rolls were also crunchy. It had a nice colour and the vermicelli and veggie filling had a nice fish sauce flavour to it. Didn't really need the accompanying sweet chili dip. We ordered some salads as well starting with the Yum Neau or beef salad. By the looks of it, we weren't expecting the salad to have any impact. As it turns out, the salad had quite the kick. 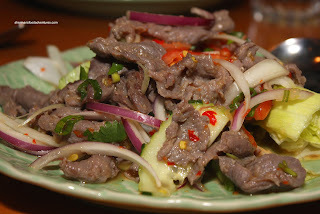 Although, the heat did not detract from the other flavours such as fish sauce and lime juice. The beef was quite tender as well. The second salad was Yum Woon Sen which consisted of shrimp, minced pork, vermicelli, onions, peppers, scallions, chili flakes, lime juice and fish sauce. Once again, the salad had an apparent heat to it with a nice kick of tart and saltiness. I think other than the green salad and tofu appetizer, we had ordered everything that was available. 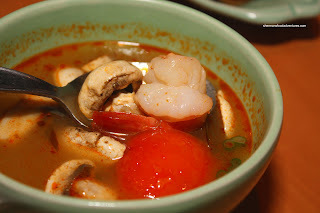 We ended up getting the only soup which was the Tom Yum Goong. It's essentially Tom Yum soup with prawns. Curiously, it was not as flavourful as the one we had at Charm. That doesn't mean it wasn't good though. It still had obvious hits of galangal, lemongrass and fish sauce while the prawn was perfect. Ultimately, it ended up to be quite mild tasting. 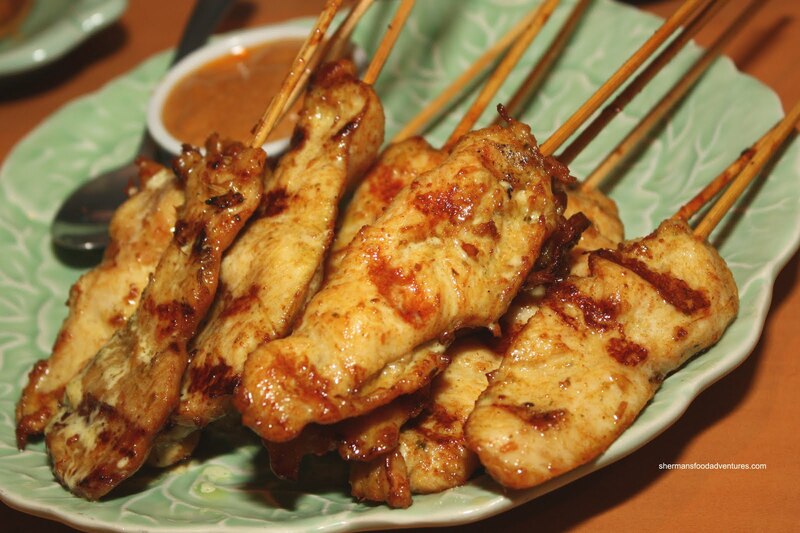 The Chicken Satay would be our second last out of the "appetizers". By this point, we were actually getting full. I must give it to my eating companions, they stuck with it. Anyways, the chicken satay was quite meaty employing all white meat. For me, I much prefer dark meat since it is generally more moist and flavourful. However, more people prefer white meat and I can understand why they would use it here. With that being said, it wasn't dry and the peanut sauce was pretty good. Unlike some other versions, this one was light and not sweet; rather, it was very nutty. Okay, now for our last appy which was BBQ Short Ribs. 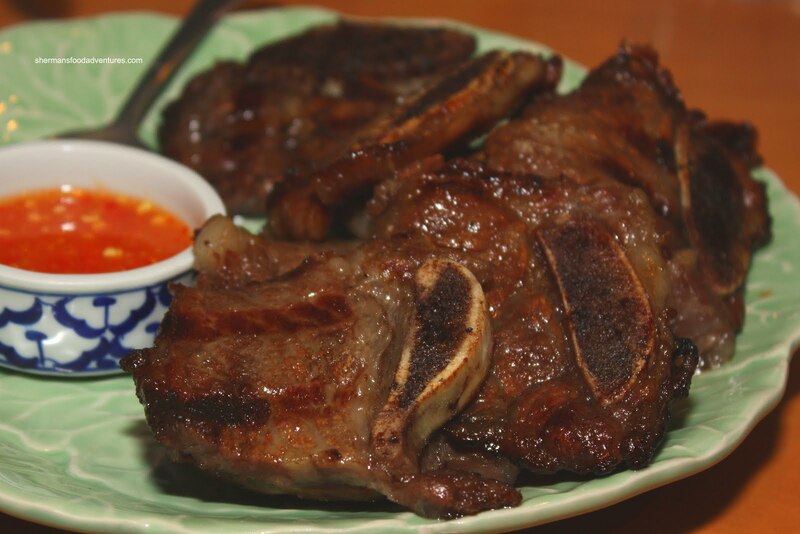 The short ribs were tender and meaty albeit quite salty (too much fish sauce?). However, this was completely rectified by the fabulous dipping sauce which has a slight kick and tonnes of tartness. This easily cut through the heaviness and saltiness of the ribs. By now, we were seriously doubting we could handle the main dishes; but we wouldn't stop would we? 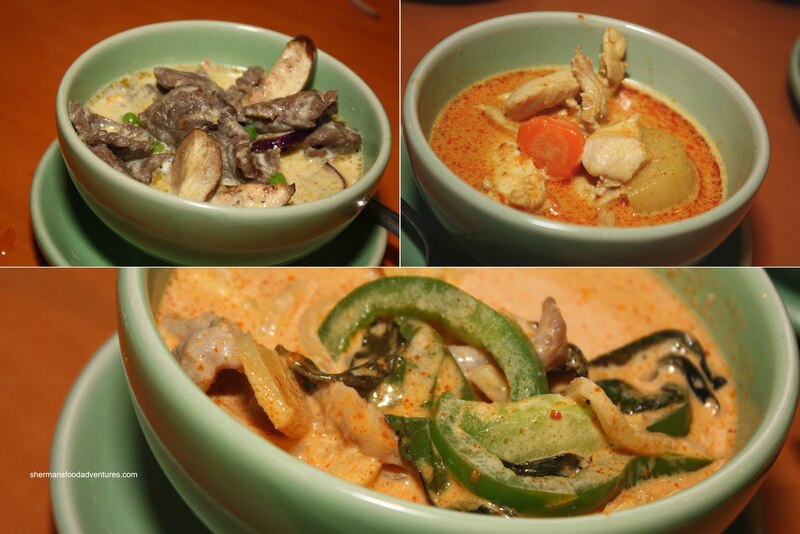 So we got down to business with the curries staring with the Beef Green Curry. With obvious similarities to the Thai House version, there was a pronounced coconut richness with only a mild amount of spice. The beef was both plentiful and tender with lots of nicely cooked eggplant and peas. For those who complain that the curry should be spicier, you have to realize that the food is made to satisfy the lowest common denominator. Hence, if you want it spicier, just ask. In terms of spice, the Pork Red Curry was milder than the green curry despite the red hue. This is generally the case, which is why I prefer green curry. With less spice, the other flavours, specifically the bamboo shoots, came through. Tender pork, green peppers and basil rounded out the ingredients. Our last curry was the Chicken Yellow Curry. I'm a bit biased when it comes to yellow curry. It is not personal favourite, possibly since it most closely resembles the Chinese version. I've never been a huge fan of it. It is more aromatic and less spicy than green and red curries. Ultimately, it has less impact which actually goes well with the chicken. This one here was what it was. I did like the potatoes though, nothing better than soft potatoes in curry! Well, it was inevitable that we got a couple orders of Pad Thai. Seems like I have it every time I'm in a Thai restaurant. Call it the "tourist" approach to eating ethnic food. 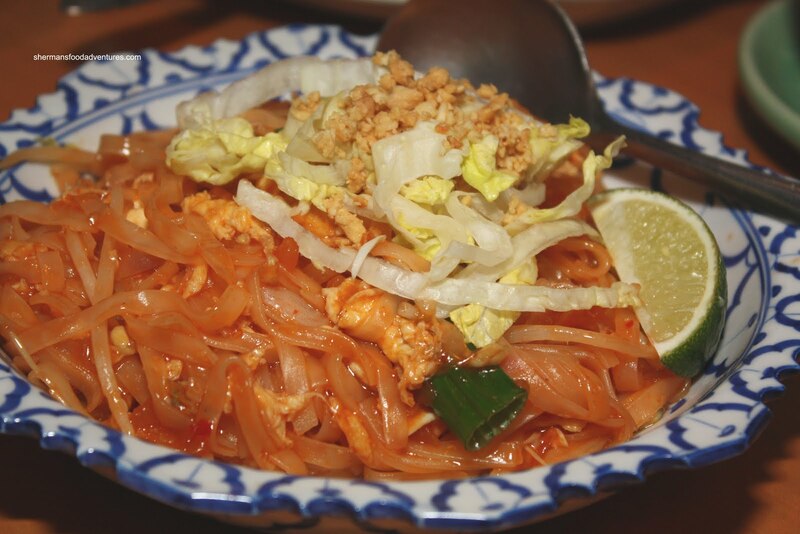 Anyways, it is widely known that there is no tamarind in the Thai House version of Pad Thai. Now, for me, I prefer tamarind; but... and this is a profound but... most people wouldn't really know the difference and frankly do not care. The main question here is: was it still decent to eat? Yes it was. The noodles were perfectly chewy with just the right amount of moisture. The lack of tamarind was partially alleviated by the abundance of pickled turnip with added a nice tang and crunch. The requisite pressed tofu, egg, sprouts and ground peanuts rounded out the dish. Did I miss the tamarind? Yah. But that's just me. I can't speak for everyone. The other well-known Thai noodle dish is the Pad See-Ew. 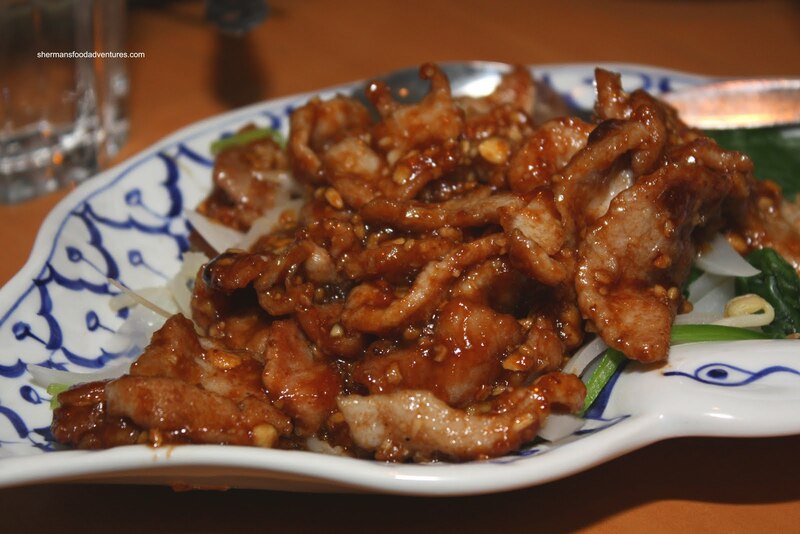 It most closely resembles a Chinese fried noodle dish due to the use of soy as its main flavouring agent. Despite the mild taste, in some ways I enjoy this more than Pad Thai. This one was more than acceptable with a plethora of crisp veggies and chicken. The noodles were perfectly cooked and there was no excess moisture. We were a bit ambitious with our ordering. Wait, lemme rephrase that. I was too ambitious with the food selection and ended up ordering another noodle dish in the Pad Mee. 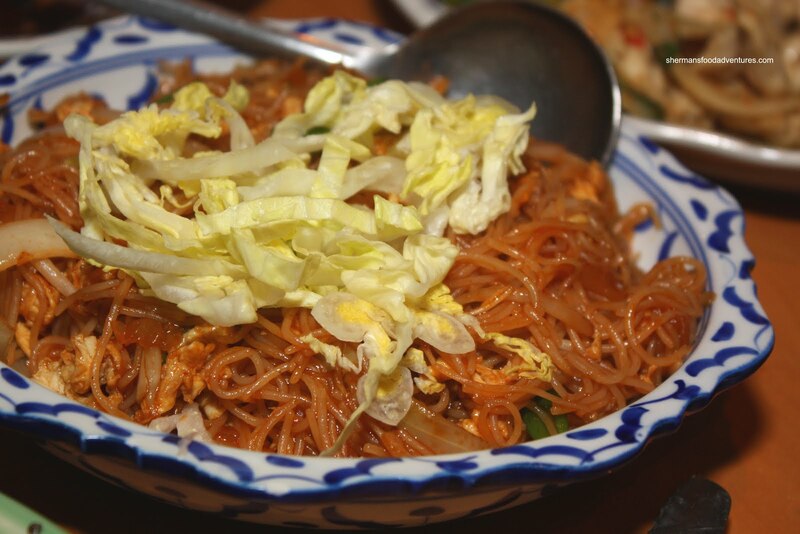 In some ways similar to Pad Thai, the flat rice noodles are replaced with thin vermicelli noodles. Generally, it is more spicy as well. In this case, it wasn't appreciably spicier. It was sweet with some tang with a bit of hot. I did like the texture of the noodles, they were al dente and coated with just the right amount of sauce. Once we got through the noodle section, it was onto the main dishes starting with the Garlic Pork. As a whole, everyone seemed to like this dish the best. Lots of tender pork intermingling with a slightly sweet, slightly spicy and garlicky sauce. Now for the rest of the dishes, I put them in one picture because they were all somewhat similar on some levels. There were subtle difference; yet not enough for me to go into much detail. 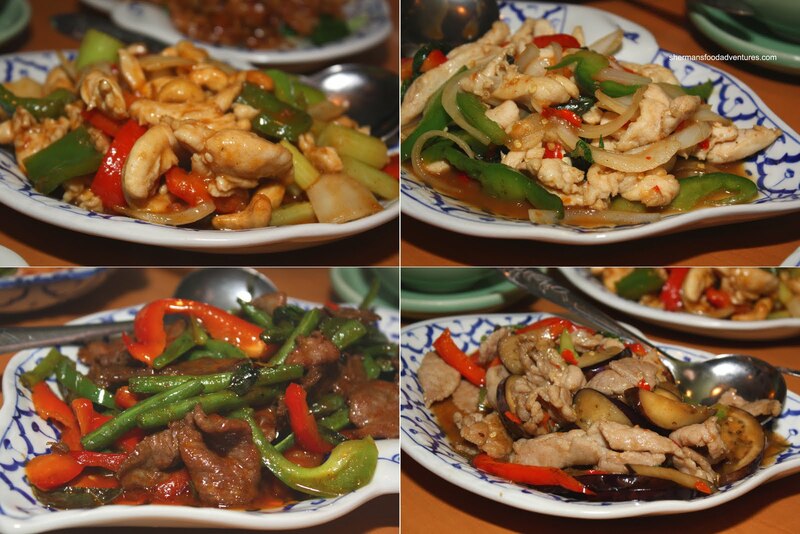 Going clockwise starting on the top left is the Gai Pad M-Mung Him Ma-Pan (Cashew Chicken), Pad Bai Grapua (Basil Chicken), Pad Makuayaw (Pork with Eggplant) and Pad Prig Khing (Beef with Green Beans). I thought the best of the bunch had to be the chicken with basil. It had the most unique taste of basil with Thai chilis. The cashew chicken was almost the same minus the basil and add cashews. The other 2 dishes were not bad and ended up to be what was expected of them. As for dessert, there were 2 choices and of course we had both. In fact, we had one of each for everyone at the table. Yes, we are indeed gluttons. 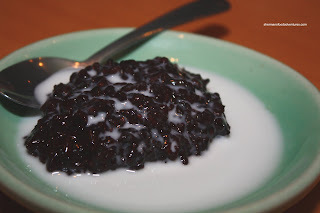 Anyways, the first one was the Black Glutinous Rice Pudding. Served with sweet coconut milk, we thought it was only "okay". We did like the chewy texture; but the dessert had very little impact in terms of flavour. We realize it is supposed to be mild. It's just not our personal favourite. We all liked the second dessert - Kanum Sakoo (Tapioca Pudding). 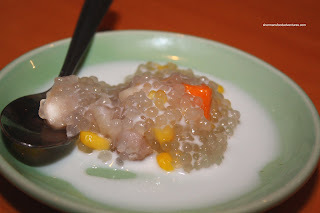 A combination of sweet corn, taro and carrot mixed with tapioca in sweet coconut milk, this was naturally sweet. Interesting combination of ingredients that worked together. This was a pleasant finish to a truly value-packed meal. For $16.00/person, there is not much to complain about really. Sure, it was not the best Thai we ever had nor were we expecting it. But it was serviceable and at-most-times, surprisingly good. Say what you want about the Thai House Group. 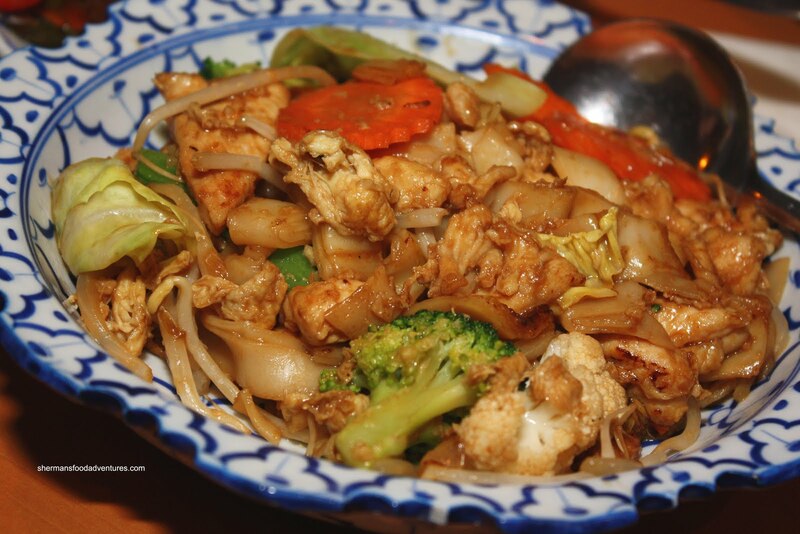 For me, they make Thai food accessible and at a reasonable price. Consider the many locations that exist in the GVRD - they must be doing something right. haha...I just wrote a post on the AYCE here too. I was pretty pleased with the quality of food and service. The best part about this place was all the different dishes we could try despite there being only two of us. Bluebeard, Nikita, Herbie, the Lovebug, LanaBanana, you have some interesting friends Sherman! Gigi, I agree. For the price, not much to complain about really. I hate that kind of pad si ew. I agree it is better that pad thai when done well, but it should have fresh broad rice noodles and gai lan. NOT BROCCOLI!!! 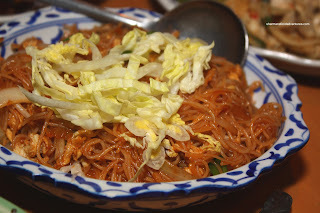 For me, it is sort of the thai version of my favourite noodle dish, gon chow ngau ho.